Easy and measurable customer feedback with Smileys. That’s what the Finnish company HappyOrNot provides for their customers. HappyOrNot services more than 4,000 clients in 117 countries, with over 25 000 physical Smiley Terminals existing around the globe at the airports, offices, shops, etcetera. You have most likely pressed one of the four Smiley faces. Very simple and quick! The first Smiley Terminals were installed already in 2010, and they have been well-received by B2B customers ─ and their end customers. But the design was getting outdated. HappyOrNot partnered with Treon and Omuus to redesign their product portfolio. Smiley Terminal TM needed a modern design, and Smiley Touch TM was a completely new product with an option to give more detailed feedback, answering where, when and why. Treon’s strong expertise in mechanics design and productization weighed a lot in the partner selection process, as did Omuus’ impressive experience in full range of design from research to production. Smiley Terminal and Smiley Touch may seem like simple products on the outside, but there were many requirements to consider in the design. The product appearance need to attract attention but not steal it; to represent HappyOrNot brand and to be branded by the customer simultaneously; they have to be easy to assemble and activate, yet difficult to misuse or damage; they have to be stable not to fall; circuits and other electronics used on previous Smiley Terminal generations had to match the new designs; materials needed to be in compliance with regulations; all the modules should fit each other. “From a design perspective, Smiley Terminal and Smiley Touch are minimalistic products, with approachable and intuitive design to fit to different brand spaces. 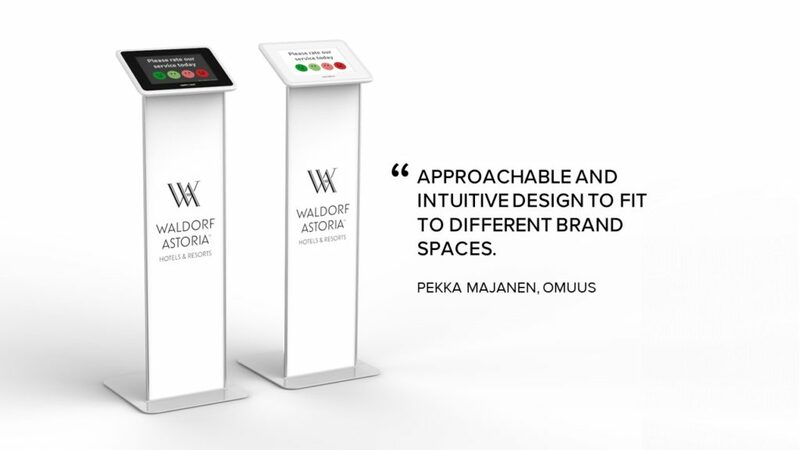 The product design encourages to give feedback,” describes Pekka Majanen, industrial design Specialist at Omuus. “In the very beginning of the design process, we focused on the product’s look and feel, haptics, and which circumstances define the feedback experience. Once the product framework was set together with HappyOrNot and Treon, we started working on an elegant, natural design which is in harmony with the interface and integrates within various environments,” Majanen continues. “We had to find an agreeable solution for all parties, and design mechanically and structurally durable, cost-efficient and functioning products, in a way that they can be efficiently manufactured as well” Mikko Vesa, Mechanics Designer at Treon says. “We examined the past three generations of our products, and evaluated what is functional and what should be replaced,” Zautasvili explains the process. At the most intensive phase HappyOrNot and Treon had daily discussions. “What was refreshing with Treon was that they weren’t afraid to suggest new ideas as we went along. They wanted to find the best solutions for our products,” Zautasvili says. At the end of the project, everybody’s pleased with the outcome. “We had excellent cooperation with Treon and Omuus. Their team is trust-worthy, reliable, and they have a good hands-on approach,” says Marko Touhunen, Product Development Director at HappyOrNot. “We had open communications throughout the project. We listened to each other and made the products together as one team,” Mikko Vesa adds. “We are happy. The project was successful, the final product met the targets and answered our customers’ needs. We had a great team to get us there,” David Zautasvili summarizes. This article was written in cooperation with Treon.